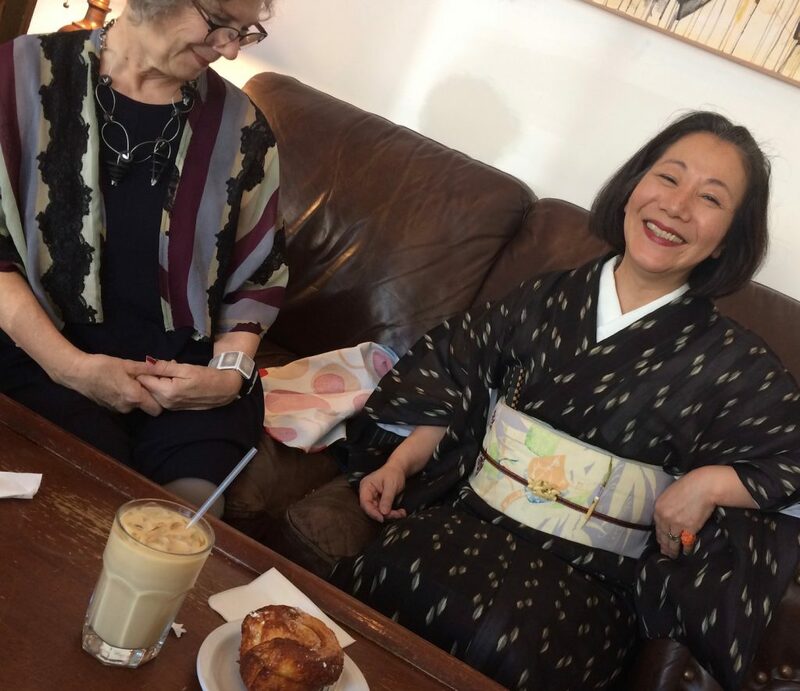 Tea with Junko and Lynn at a neiborhood coffee shop. 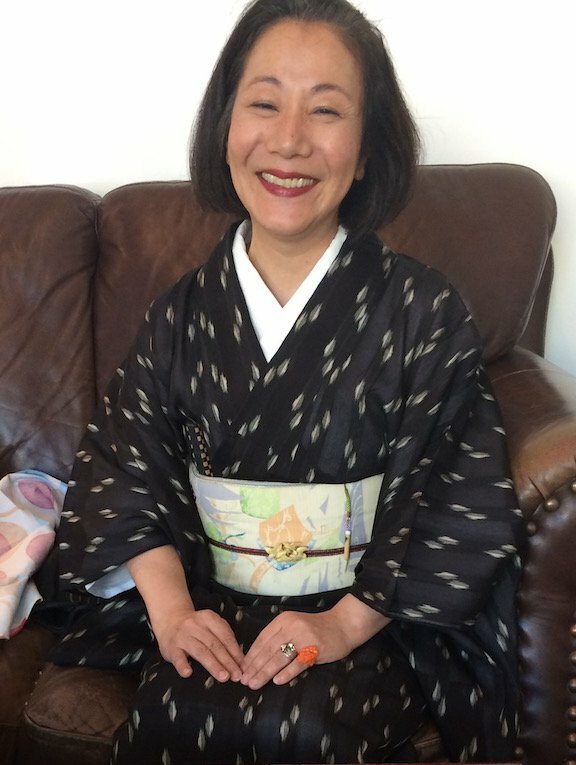 Junko, always in a beautiful kimono, this time honoring the Japanese festival Tanabata, the Star Festival. The Star Festival celebrates the once a year meeting of two deities, lovers that had been separated by the Milky Way. Angry that his daughter had neglected her loom and was no longer weaving the cloth he so loved, her father had kept her isolated and away from her lover. 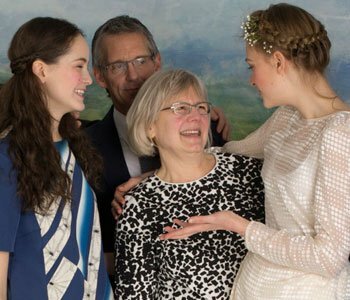 Moved by his daughters tears, he relented and allowed them to meet once a year. But the lovers could not cross the Milky Way. Again the daughter cried until a flock of magpies came and made a bridge from their wings. 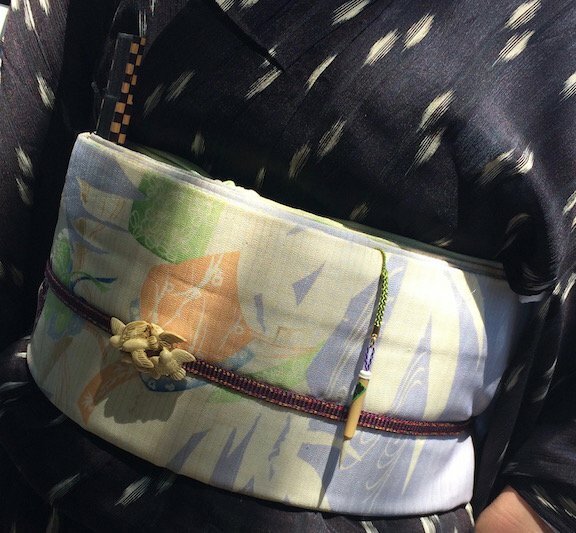 Inspired by the story, Junko added birds to her obi. Her kimono looks like scattered stars. She has also added a little brush. People celebrate the festival by writing their wishes on little strips of paper and hang them from bamboo. Traditionally, boys wish for better handwriting. A starry midsummer kimono, the perfect thing to wear for an afternoon in July. Thanks for sharing this lovely bit of Japanese culture Ann. I enjoyed the wording, thoughts, bit of history, and photos very much.